Today I’m reposting something I wrote on the 22 of October 2009. I recently did a psychometric test that reminded me of this blog post and the increadible work of Daniel Pink. It’s been so very long since I did a test of any kind, especially one that’s timed, it got me thinking of how important practise is and it got me curious, once again, to dig deeper into all the research that Dan Pink (and others) have spent endless amounts of time on. After this post I was contacted by the marketing teams behind the launch of A Whole New Mind to write a review for his new book ‘Drive’. “It took me a long time to realise that I could question my reaction to something! That my reaction could stem from what I was taught vs. what I believe within me to be true?” This is a statement I must keep reminding myself of and I know I am not alone here. Both book’s are very worthwhile reads and the big lesson to me is that now, when I decide to do something, I want to know who and what’s driving it! Not to mention where its taking me? A Whole New Mind – by Daniel Pink from Board Studios on Vimeo. I’m having one of those, I miss big book stores, moments right now. So badly just want to pop in and buy “a whole new mind”! Thank you Maureen Moore for pointing me to this video! You see, I’m naturally a right brain person, I know its hard to believe sometimes, especially when you get to know me and hear I spent 14 years in the financial/software world! But if the truth be told I knew deep down inside me most of my time in this world was playing catch up and often feeling like a fool. Secretly this probably felt ok to me then, I’d grown up trying to make things good with all, all the time, so this environment of struggle was just right. It’s not all bad though, I am super grateful for those years, that experience and the people I shared the rides with were an inspiration and almost always a challenge to understand, for someone like me that’s a great thing, I’m always curious, and this world was endlessly curious to me. Often I seemed to take so much longer than others to “get it”. Also, I would never have had the opportunity to structure so many spreadsheets, spend days trying to understand pricing software and endless, that’s endless amounts of brain power understanding what all the financial terms meant. I have a special memory around ‘what are CDS’s’? In some ways its a joy to know I wasn’t the only one not understanding what I was doing, only, what I’m way more grateful for is finding my way to living my life on my terms, letting my heart have a say every day. Without that dominant left brain experience I’d not have found my way here, Thanks to Daniel Pink for articulating this way of being so well, I cant wait to read the book! Left brain: I am the left brain. I am a scientist. A mathematician. I love the familiar. I categorize. I am accurate. Linear. Analytical. Strategic. I am practical. Always in control. A master of words and language. Realistic. I calculate equations and play with numbers. I am order. I am logic. I know exactly who I am. 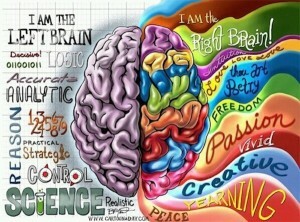 Right brain: I am the right brain. I am creativity. A free spirit. I am passion. Yearning. Sensuality. I am the sound of roaring laughter. I am taste. The feeling of sand beneath bare feat. I am movement. Vivid colors. I am the urge to paint on an empty canvas. I am boundless imagination. Art. Poetry. I sense. I feel. I am everything I wanted to be.